You are at:Home»Software Development»Java»ADF 12c: Adaptive applications through reusable bindings using 12c Dynamic components, runtime switching from ADF BC to a POJO data control v.v. Here we notice a couple of things. First of all the “af:dynamicComponent” tag. 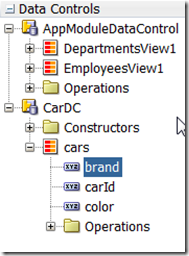 The component that is rendered depends on the attribute’s data type. It supports: inputText, inputDate, inputListOfValues, selectOneChoice, selectManyChoice, selectOneListbox, selectManyListbox, selectOneRadio, selectBooleanRadio, selectBooleanCheckbox and selectManyCheckbox. This can be used with dynamic form as well. Secondly notice the “af:iterator”. In 11g you were bound to the use the “af:forEach” tag. With the af:iterator we can enjoy the benefit of having unique IDs for our columns at runtime and the application will keep working when switching on MDS. One minor disadvantage is however that we cannot use table filtering with the af:iterator. If we would like that we have to use the af:forEach afterall. Perhaps Oracle will solve this in the next release. You need to change all references in the af:table tag in your page to “EmployeesView1”, to point to “GenericView” and all works just fine. 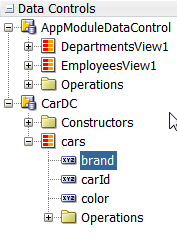 The attributes of the tree tag that are removed are redundant. They might be important in trees, but not in tables. This makes the binding fully dynamic, so that it can be used in a generic way. You just made the ViewController part fully dynamic. At runtime you can change what data control is shown, by injecting the right data control name in the binding layer. If you want, you can run the application module against different connections as well. This can be achieved by making the bc4j.xcfg dynamic. You can read all about that in the blog ‘Adaptive Connections’ by Duncan Mills. Of course you can set the variables in the bindings at runtime with a “af:selectOneChoice” tag. The result is that you can select which datacontrol you want to show in your page and you can switch between ADF BC and POJO datacontrols all the same.